We are excited to help bring this week’s DrupalCon Denver 2012 conference live to your desktop through another collaboration between our two organizations. Brightcove will be streaming each of the DrupalCon keynote addresses live on the conference website at http://denver2012.drupal.org from Tuesday, March 20 through Thursday, March 22. It's a relatively calm scene at the Colorado Convention Center on the eve of DrupalCon. 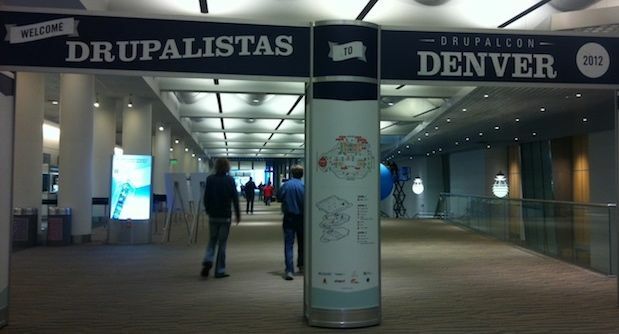 The DrupalCon live stream is powered by Brightcove’s Video Cloud online video platform. Video Cloud’s live streaming capabilities support smooth video at multiple bitrates to deliver renditions that are optimized for each viewer’s available bandwidth, processor utilization and player size. The live stream will also incorporate Video Cloud’s live DVR functions, allowing viewers to pause, rewind, review and replay live streaming video throughout the event. Brightcove’s work with Drupal goes well beyond providing live streaming for DrupalCon. An open-source integration between Video Cloud and Drupal makes it easy for Drupal users to incorporate Video Cloud-powered video content into their sites. More information on the integration is available on the Brightcove website. If you can’t make it to Denver for DrupalCon 2012, be sure to watch the live keynotes on the site and follow conference updates on Twitter using @drupalcon and #drupalcon.